If you have tried my Pie Crust, you may as well throw that recipe out. Ok, don’t throw it out…. but consider this a quicker option. This tart shell is so tasty and much easier to prepare. It’s a slightly sweet cookie crust that can be filled with anything your heart desires. Stir together the melted butter and honey. Add the dry ingredients and stir well to combine. Press the dough into the greased tart shell. Spreading as evenly as possible. Place in freezer and preheat oven to 350. For a fully baked tart shell, bake for 15-18 minutes, until nice and golden brown. Allow baked tart shell to cool completely before filling. *Baked tart shells can be made in advance and keep for up to 1 week in the fridge or 1 month in the freezer. Next week I will be posting some recipes for fillings and tarts…. stay tuned! This entry was posted in Gluten Free and tagged gluten free, grain free, scd, vegan. Bookmark the permalink. I made this pie crust and boy was it ever fantastic! I ended up doubling the recipe to fill the tart pan, so it was rich and thick and complemented a zippy strawberry and fresh rhubarb filling. This recipe is definitely going to become a staple in my household! Hi there, I stumbled upon your fruit tart recipe on Pinterest. 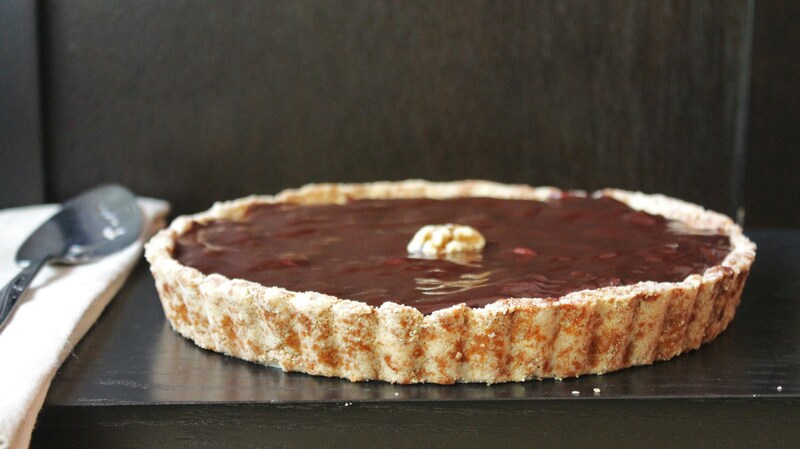 I’ve been looking for a Gluten Free Tart Shell to make and noticed you had this one posted up. I’m excited about trying it out! Looks good. Thanks Leticia! So glad you found me, I love Pinterest! Are there any good substitutes for almond flour? My son is very sensitive to almonds and what can I use to replace lemon? Thank you. I look forward to trying your recipes. My daughter-in-law has Celiac and my son-in-law is Type 1 Diabetic, so finding recipes that they both are able to eat is challenging. I made mini cheesecakes with this tart crust instead of the vanilla wafer cookie the recipe required. This crust is very versatile, and I am so happy to have found it!